The humble hot dog is the subject of much rumor and speculation as to what it contains. It is reassuring to know that frankfurter content is regulated by law in the United States. The term frankfurter covers hot dogs, wieners, and bologna. Traditional meat hot dogs are made of pork, beef, or veal, but now there are many variations available that are made from poultry or even vegetarian products. Hot dogs are already cooked or smoked so the product needs only to be reheated. They are available with or without skins (casings). If the casing is from a different source than that of the hot dog, this must be listed on the label. Hot dog sizes range from about 2 inches (cocktail wieners) up to the famous foot-long hot dogs popular at sporting events. The most popular hot dog size is the standard 6-inch length usually sold in packages of 10. Nobody can explain why hot dog buns are sold in packs of eight. The regulations say that frankfurters may contain up to 30 percent fat or up to 10 percent added water. Up to 3.5 percent can be non-meat binders and extenders, which include dried milk or cereal. Up to 2 percent can be isolated soy protein. These must all be shown on the label. If a hot dog is listed as "with byproducts" or "with variety meats" it contains at least 15 percent of raw skeletal muscle meat with raw meat byproducts. The meat byproducts can include organ meats such as heart, liver, or kidney. ​Beef or all-beef: Contains only beef with no soybean protein or dry milk solid fillers added. Pork: Must only contain pork. Kosher: All-beef, usually heavily seasoned with garlic. Meat: A mixture of pork and beef, usually 40 percent pork and 60 percent beef with no fillers. The meat might be trimmed from the bones using advanced meat bone separation and meat recovery systems. These ensure that bones are not included in the grind. Frankfurter: May contain up to 3.5 percent fillers and made from a combination of meats. Mechanically separated meat (MSM): This process is used for pork but is not allowed for beef. It forces bones, with attached edible meat, through a sieve at high pressure. Hot dogs can contain no more than 20 percent MSM. Mechanically separated poultry (MSP): Turkey and chicken can be processed through a sieve as well. There is no percentage limit. ​Chicago dogs: Yellow mustard, dark green relish, chopped raw onions, tomato slices, celery salt, and a poppy seed bun. Kansas City dogs: Sauerkraut and melted Swiss cheese on a sesame seed bun. 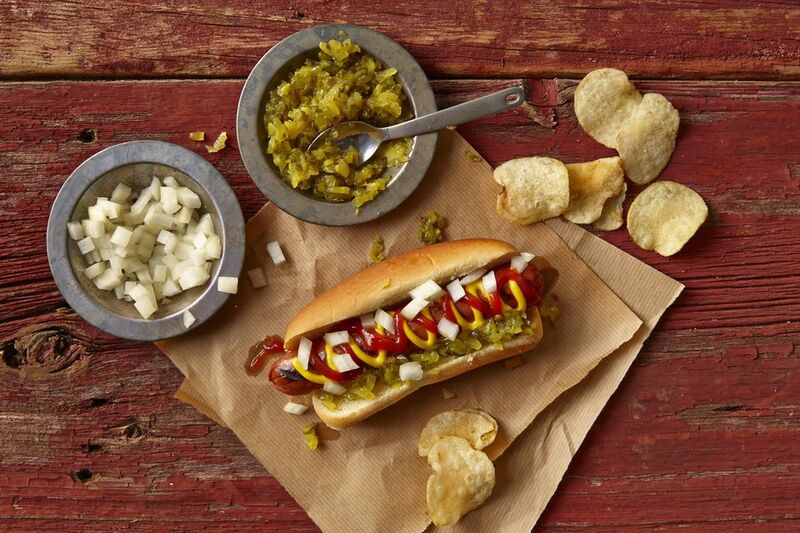 New York City dogs: Steamed onions and pale yellow mustard sauce. Coney Island dogs: Topped with a spicy meat mixture. Corn dogs: Placed on a stick, dipped in cornbread batter, and deep-fried. Tex-Mex dogs: Topped with salsa, Monterey Jack cheese, and chopped jalapeños. Pigs in a Blanket: Wrapped in pastry and baked. Baltimore Frizzled: Split and deep-fried. Lillies: Short for Lilliputians (from the Jonathan Swift novel "Gulliver's Travels"), these are about half the size of a man's thumb, also commonly called cocktail-size, and usually served as an appetizer in a sauce. The popularity of the American hot dog has spread worldwide. In Russia, where they are known as sosiska, sales have skyrocketed since the end of Communism. Russians prefer their dogs spicier, so those exported to Russia generally contain a lot more garlic. The market is also expanding in China, where rouchang is a fully cooked, cold hot dog wrapped in red plastic which is eaten like a popsicle, slowly peeling the red plastic down as it is consumed, or the hot dog may be warmed on a stick with no embellishment. No other country to date can keep up with Americans who consume over 20 billion hot dogs a year. Dress Like an American Celebrity Chef!